Apple is slowly expanding its mobile payment platforms worldwide – it was recently launched in Canada and Australia, and Apple is rumoured to be flipping the switch in China early next year – but that doesn’t necessarily mean that the most-talked-about mobile wallet is among the most popular payment methods. To bring more insight into that, research firm InfoScout (via QZ)collected data from 300,000 shoppers on Black Friday and found only half as many eligible purchases were made using Apple Pay this year as on Black Friday than last year, when the service was about a month old. Before you jump into early conclusions, let’s add that InfoScout measured only offline purchases, so it doesn’t include data from mobile apps such as AirBnb, Uber, Target, and Best Buy, which all integrated Apple Pay, so take the data with a pinch of salt. 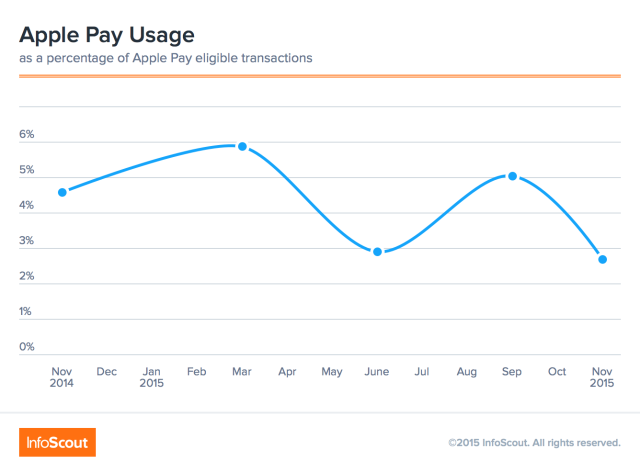 However, it is still worth wondering for a minute what could be the cause for the slow adoption of Apple Pay. It has been available for more than a year now, and during this time Apple has continuously added retail partners and banks in the US. In Canada and other countries, the situation is a bit different, though. Did you use Apple Pay on Black Friday?